Lochtegate: what is wrong with this picture? The producers of DWTS must be themselves dancing with glee over this publicity coup. Everyone loves a train wreck. Who wouldn’t tune in? 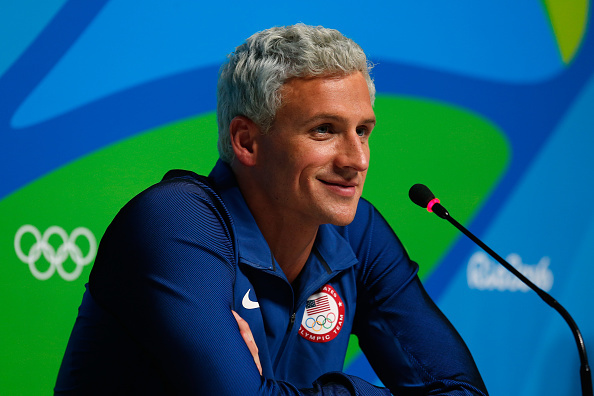 Reports emerged Wednesday that Lochte would appear on the show. He was said to have struck a deal to appear on DWTS before Lochtegate — that is, his purported robbery tale and its twists and turns at the just-concluded Rio Games. Everybody has a right to make a living and, goodness knows, Lochte may be in need of cash flow after four sponsors ditched him on Monday. But that’s not the only interest that is crying out here to be served. How is it that a guy who “over-exaggerates,” to use his phrasing, gets to revel in a network-TV spotlight when he, whether intentionally or not, cut and run in the aftermath of whatever it is that happened at that Rio gas station, leaving his three much-younger teammates to fend for themselves with the Brazilian authorities while he, details of the story changing with different tellings, was already back in the States? Lochte would hardly be the first to try the DWTS approach to redemption, as the Atlantic magazine underscored in a piece published Wednesday. The difference is that he is an Olympic athlete -- not a politician, or a politician's kid, or a celebrity chef. Being an Olympic athlete -- in Lochte's case, a multiple Olympic champion -- brings with it a different set of responsibilities and sensibilities. Bristol Palin as role model? Be serious. Paula Deen? Get real. But Ryan Lochte, until Lochtegate, was role model to a lot of people. That's why the likes of Apolo Ohno, Shawn Johnson, Nastia Liukin and Natalie Coughlin have been on the show. Those appearances showcased Olympic gold-medalist role models. As a USA Today report makes clear, there are lots of sides to Lochtegate. How come Ryan Lochte gets to lie and he ran away and now he’s going to be on "Dancing with the Stars"? Don’t we teach our kids that there are consequences to behavior? That the important thing is to tell the truth? That lying about it afterward is worse than whatever it is that actually happened? Perception is as important, if not more, than reality. The USA Today report makes plain that elements of what Lochte has said are, in fact, true. But that pales in comparison to the big picture — the impact on impressionable young people, especially with school starting up again, because that first reasonable school-kid question leads directly to the next, which is the core issue. What kind of message does it send to America’s young people when Olympic athletes misbehave and then seemingly get rewarded for it? Doesn’t that cut against every single nugget of accountability and responsibility we as adults say is important? He is 32 years old. He was out with three college kids. Way after midnight, when grown-ups know nothing good happens. If you are in your early or mid-20s, and a guy — supposedly a team leader — who is 32 says, let’s do x, and this is a guy who you grew up idolizing on YouTube and now you’re out partying with him, you’re going to say no? By his own account, Lochte had been drinking. A lot. So much that when he gave his first account to Billy Bush, he says, he was still feeling it. What’s especially disquieting about all this is that USA Swimming has long had a distinct culture of accountability and responsibility. Over the years, at any number of world championships and Olympic Games, the stand-up nature of America’s best swimmers has readily come to the fore when someone, say, makes a mistake on a relay — it’s one for all and all for one. But that’s not in any sense what happened here. Where is Lochte’s accountability? Where was his responsibility to his younger teammates and, indeed, to the team itself? Before any edition of a Games, every single U.S. athlete on an Olympic team, since the days of ski racer Bode Miller’s declaration at the 2006 Torino Winter Games that he got to “party and socialize at an Olympic level,” goes through what’s called an “ambassador” program. The thrust is to remind American athletes that being on the Olympic team is a privilege but one that, because they are Americans, carries special responsibilities. Be humble, the U.S. Olympians are told. Most of all, be respectful in every regard when it comes to the host country. Lochte has been through that program at least three times — 2008, 2012 and 2016. Or at least he should have been through it three times. What, did everything sound to him like Miss Othmar in the Charlie Brown cartoons? Wah wah wah? What? A point of intrigue here is that Lochte had said in Rio, after he was done racing but before the whole thing erupted, that he was mentally, physically and emotionally worn out. Maybe he would try to come back in four years to try for the Tokyo Olympics, he said, but for now he needed some time off. One of his fundamental miscalculations is that he got going on that time off too soon. USA Swimming officials would be 100 percent right to assert that the best parts of their culture run deep. At the same time, something is clearly amiss when this Lochte situation is directly traceable to alcohol; Michael Phelps was arrested twice on suspicion of DUI before getting himself to rehab; and the Brock Turner sexual assault case at Stanford was tied to alcohol consumption. Alcohol and a party culture have for years been part of the big-time swim scene, too. Lochte has long been a fixture. A quick Google search will prove the point — just try “Ryan Lochte” and “Las Vegas” and see what turns up. The alcohol thing is by no means any sort of excuse for anyone’s behavior. It may be offered as explanation. But that absolutely does not elevate it to excuse. None of this is fun to write. I have known Ryan Lochte for many years. He has always been kind, gracious and courteous to everyone he has met at and around USA Swimming affairs. He is not anywhere near as dumb as most people believe. That’s his public persona. Moreover, he has for years been the face of USA Swimming in any number of promotional campaigns. That is because — in addition to being ripped and good looking, obvious positives when you’re doing an ad campaign — he can be, genuinely, a really good guy. But what Lochte did in Rio was the opposite of what really good guys do. For one, he robbed any number of worthy athletes of their Olympic spotlight. That’s inexcusable, moments lost forever in time. As Scott Blackmun, the USOC chief executive put it in a news conference as the Games were winding down, referring to Lochte and the three other swimmers, “They let down our athletes. They let down Americans. Lochte’s conduct has also set in motion any number of inquiries. One, by the International Olympic Committee, seems entirely out of line. This is not an IOC problem. If Ryan Lochte is their problem, then so are the two Mongolian wrestling coaches who stripped out of their clothes, one to his underwear, in protest of a controversial scoring decision. So, just to be even more obvious, is Patrick Hickey, the Irish member of the IOC’s policy-making executive board, arrested in Rio amid allegations of misconduct with Games tickets; he is being held in a maximum-security Rio prison while his case slowly moves along. As far as eligibility goes, what to do with Lochte is appropriately a matter for the U.S. Olympic Committee; USA Swimming; and the world swimming body, which goes by the acronym FINA. The starting baseline, clearly, is six months off. At the least. Last year, USA Swimming suspended Phelps for six months and kept him away from that summer’s world championships. In Lochte’s case, how meaningful, really, would six months off be? Like zero. Next year’s world championships are almost a full year away. Whatever the terms of the suspension, in addition Lochte needs to be ordered to do some sort of community service. Say, teaching kids to swim. Or picking up garbage on the side of the highway — which might help make clear to him the elements of privilege that he indisputably has put on display. If he were smart, Lochte ought to get ahead of this story and get himself to rehab. Like Phelps was, he is at a crossroads: trying to figure out who he really is, and what his identity is, or ought to be, when he’s not swimming for Olympic medals. If he does rehab and can stay clean and sober for a while, then maybe Lochte deserves a shot at something like "Dancing with the Stars." Then the narrative changes. Then he becomes a redemption story. Everyone — again, everyone — makes mistakes. And everyone — this includes Ryan Lochte — deserves a second chance. What he doesn’t deserve, right now, is the chance to capitalize on bad behavior. That’s just wrong. 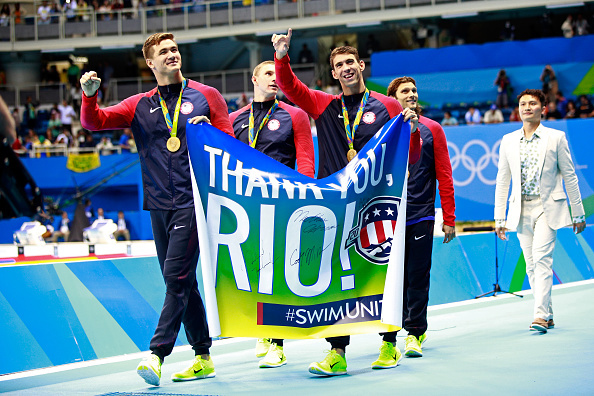 RIO de JANEIRO — Coming into these Rio Olympics, after the U.S. team’s underwhelming performance at the 2015 World Championships, there were concerns far and wide about how the American swim team might do at the 2016 Rio Games. Now the answer is as plain as #PhelpsFace. The 2016 U.S. swim team was, in a word, riveting. The trick is to figure out how to accept direction, guidance, criticism and more from the other, understanding that he or she genuinely wants the best for you — without all of that leading to feelings of being diminished, demeaned or, worse yet, submission. Draw your chairs closer into this little group therapy circle, please: that acceptance explains precisely why Michael Phelps is swimming unbelievably great at these 2016 Olympics, which he swears — uh-huh — will be his last. RIO de JANEIRO — If Thursday night’s men’s 200m individual medley final between Michael Phelps and Ryan Lochte was the end, as Jim Morrison and the Doors once said, it made — in a riff on what Morrison also told us — for no safety yet a big surprise, a race in which two of the best, ever, pushed each other one final time. Each in his own lane, literally and figuratively, Phelps and Lochte have for years been on a similar quest. Their mission: to push boundaries in search of excellence. As Morrison put it, to be limitless and free. After London, these words seemed to apply, and in full measure. Phelps said he was done. He was not. He had unfinished business. At these Rio 2016 Olympics, a Games he repeatedly has declared will be his last, Phelps on Thursday night staggered the field over the final 100 meters to win the 200m IM, and by nearly two seconds. RIO de JANEIRO — If you had a son, you would want him to be just like Nathan Adrian. The guy is smart, funny, respectful and humble. He is quiet, steady, a genuine leader. Oh, he’s tall and handsome, too, the very picture of America’s best pluralistic and tolerant tendencies. His dad, James, is a retired nuclear engineer; his mom, Cecilia, who comes from Hong Kong, is a nurse. Oh yeah — Nathan Adrian is an incredible athlete. 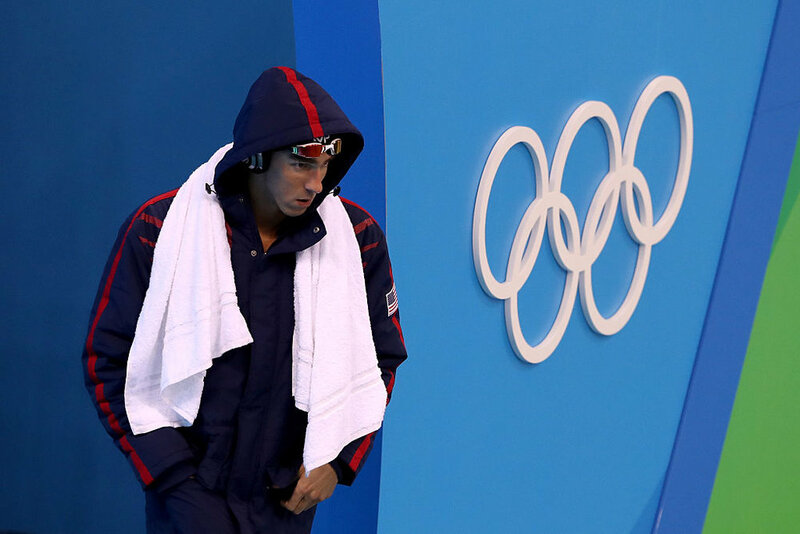 RIO de JANEIRO — When, oh when, will everyone learn to stop riling up Michael Phelps? In the latest chapter in a long-running story of what happens when you poke the bear, Phelps, obviously fired up by South African star Chad le Clos’ antics Monday in the ready room, won his 20th Olympic gold medal in the event that has seemingly forever meant the most to him and his family, the 200m butterfly. RIO de JANEIRO -- Lilly King is a great swimmer. But a good sport? One who lives — in her gold-medal moment — the key Olympic values: friendship, excellence and respect? Much of the English-speaking media proved all too eager Monday evening to latch on to an easy — and false — narrative that abruptly cast King as a virtuous American hero, striking a blow for drug-free sport in winning the women’s 100m breaststroke while slaying the notorious Russian, the sudden villain Yulia Efimova. RIO de JANEIRO — Of all the images from Michael Phelps’ storied career, perhaps none is as visceral — as open and truthfully honest — as the shot from the finish of the men’s 4x100 freestyle relay at the 2008 Beijing Olympics, a portrait of Phelps screaming to the heavens in raw, primal, triumphant victory. This was the race in which Jason Lezak somehow willed his way past France’s Alain Bernard. Lezak was behind when he dove in. He was behind at the turn. He was behind until the very end, when he out-touched Bernard in a moment that instantly became an Olympic classic. Right there on the deck, Phelps, who had set the Americans to the lead in the first leg, roared. Right behind him, Garrett Weber-Gale, who had pulled the second leg in the relay, fists clenched, leaned back and screamed in jubilation. Both guys were in their star-spangled LZR suits. 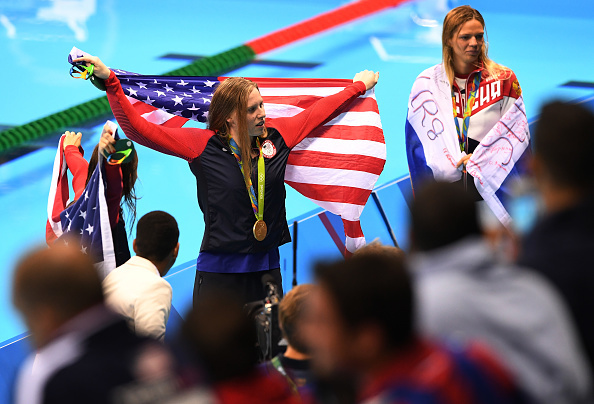 This is the red, white and blue moment the U.S. swim team lives for. RIO de JANEIRO — If, like most people, you last paid serious attention to Olympic-caliber swimming in London, when that Michael Phelps dude announced he was retiring, welcome back to the pool for your every-four-years dip, and just in time to catch the one and only race at these Games at which Katie Ledecky was always likely to take second instead of first. In the final swim of the final event of the first day of swimming’s nine-day run here at the Rio 2016 Games, Ledecky anchored an American-record 3:31.89 in the women’s 4x100 meter freestyle. It took a world record 3:30.65 from the Australians, who were heavily favored, to win. Even in second place, the legend of Katie Ledecky just keeps getting better and better. This was the first time Ledecky had ever — ever — raced the 4x100 relay for Team USA at an international level. The last time she swam in a 4x1 was in high school, she said afterward with a laugh. OMAHA — Katie Ledecky makes swimming must-see. In-person. On TV. Online. Whatever. Whenever the 19-year-old gets on the blocks, there is the wondrous sense of possibility in the chlorinated air. It just feels like something might — very well — happen. On Saturday, in the 800-meter freestyle, an event she has owned since 2012, where at just 15 she won gold at the London Olympics, Ledecky — in predictably awesome fashion — ran away with the event, winning in 8:10.32, flirting for the first half of the race with the — her own — world record. The victory sends her to Rio to swim in the 200, 400 and 800 freestyles, plus at least one and maybe two relays. She will be favored in all three individual events. She won all three at the 2015 swimming world championships in Kazan, Russia. Ledecky would be favored in the 1500 if there were a 1500 at the Olympics for women. There isn’t, an anachronism. Last year, in Kazan, she won that, too. She also said of 8:10.32, “It just didn’t feel like it was anything special.” That time is only the third-best ever. To prove that she is actually human, Ledecky did not qualify here for the 100 free. She took seventh. The thing with Ledecky is not just that she wins. That’s almost a given. In the 100, incidentally, she is getting better each year. Watch out. Each Ledecky swim can make for extraordinary theater. Same with Michael Phelps, who — in his last-ever swim at the U.S. Trials, and this time he said he means it — came back strong in the second half of the men’s 100 butterfly for the victory in 51-flat. Tom Shields took second, in 51.2, just as he ran second behind Phelps in the 200 fly. Phelps was exultant when he saw the result, slapping the water. Later, he told the crowd that he had “choked up a hair” when talking on-camera to NBC just moments after the race, adding, “This country is the best.” He also swore -- vowed -- that 2016 is, really, it. Asked if he might consider 2020, he said, "No. No, no, no, no, no. I’m done. The body is done." Missy Franklin pulled out another gut-check, finishing second in the women’s 200 backstroke behind Maya DiRado, who quietly won three events here while considerable attention was focused on the likes of Ledecky, Phelps, Ryan Lochte and others — that 200 back and both individual medleys, 200 and 400. At these Trials, three swimmers have won three events: Phelps, Ledecky, DiRado. Phelps, starting in 2004, was the first to make swimming a destination event. Which, when you stop to consider that for just a moment, is almost crazy. Unlike track, basketball, beach volleyball or whatever, you can’t see the swimmers’ faces when they compete. There shouldn’t be any emotional get. And yet with Ledecky, there is. Similarly, when Ledecky gets up to race, she’s not there to do anything but immerse herself in the pursuit of seeing just how good she can be. Fear, pressure, nerves — those are for others. It was in 2013 — at the Barcelona worlds — that Ledecky signaled it would be showtime when she stepped on deck. She won the 400, 800 and 1500, and a gold in the 4x200 relay, too. And set two world records. That Barcelona 1500, featuring Ledecky, along with Lotte Friis of Denmark and Lauren Boyle of New Zealand, remains a strong candidate for best women’s distance race, ever. — At 100 meters, Ledecky was at 58.75, Friis at 59.15. This was the 100-meter world-record pace in 1971 of Australian Shane Gould. — At 200 meters, Ledecky was 66-hundredths of a second ahead. Now they were racing at the 200-meter pace set by East German Kornelia Ender in the mid-1970s. From 300 to 1200 meters, Ledecky let Friis set the pace. Then, at 1300 meters, Ledecky dropped the hammer. With one lap to go, Ledecky was up by 1.07 seconds. After 15 minutes of swimming, she then swam the last 50 meters in 29.47 seconds. In touching in 15:36.53, she lowered the world record, which had stood for six years through the nuttiness of the plastic suits, by six seconds. Friis also went under the world record, by four seconds. Boyle’s third-place time would have been the best swim of 2012, an Olympic year, and by 21 seconds. Ledecky has since lowered the 1500 mark four more times. The current mark, set in Kazan: 15:25.48. Like Phelps, Ledecky swims hard and relentlessly, with a cold fury. That is a compliment. Like Phelps, too, Ledecky swims extraordinarily high in the water. You don’t have to know the first thing about swimming to know which lane Katie Ledecky is in. The snippy answer to that, of course, would be the one in which the swimmer is the one way in front. But Ledecky has a distinct, powerful style. Many guy swimmers have said she swims like a guy. That, too, is a compliment. Off the blocks, Ledecky is lovely to be around. She is smart, funny and has an extraordinary support system — family, coaches, community. When she gets up to race, however, all that has to wait. Every Ledecky swim seemingly holds the promise of a record. Ledecky has not lost internationally in the 800 since 2012. She won the 800 at the 2013 worlds in Barcelona. She won the 800 at the major 2014 meet, what’s called the Pan Pacific championships. The all-time top-10 women’s 800 performances: all, one through 10, Katie Ledecky. In 2013, she lowered the mark that Rebecca Adlington had set at the Beijing 2008 Olympics, 8:14.1, to 8:13.86. In 2014, Ledecky went 8:11 flat. In January of this year, 8:06.68. The 800 she swam Saturday is nine seconds faster than she swam at the 2012 Trials: 8:19.78. On Saturday, after 50 meters, she was already a body length ahead. At 100, almost a full second under world record pace. By 250, 1.42 under. Then she “slowed,” if that is the word, for someone who won the race by nearly 10 seconds. Leah Smith’s second-place time, 8:20.18, was the third-fastest time in the world this year. Jessica Ashwood of Australia went 8:18.14 in June. “Probably. It was a different week, a different set of events than I’ve done in the past and, yeah — you take three rounds of the 100 out, and my schedule gets a little easier in Rio.